Applewood Farms delivers coast to coast. We have our own delivery fleet and also utilize the services of FEDEX to deliver any quantity of gifts to your place of business or to your clients and associates. Delivery time is 1-3 business days. If you prefer to pick-up your gifts, visit our Location page to get detailed directions to our warehouse facility. Whatever your terms, we will supply your custom gift packages when and where you need them. Applewood Farms delivers coast to coast. We have our own delivery fleet and also utilize the services of FEDEX - PeriShip to deliver any quantity of gifts to your place of business or to your clients and associates. To ensure the quality of your Turkey and ham on arrival, Applewood Farms cannot ground deliver Turkeys in areas that take 3+ Days to ship. If it's winter time, then 3 days or the green area should be fine, email to make sure. If you are more than 3 days away, at least a 2 day shipping must be your selected choice of shipping. If you are unsure of your hotspot area, please email us or give us a quick call at 877-293-8597. AWF does not ship on Thursdays or Fridays except for packages with a ONE-DAY delivery designation. AWF is not liable for shipping delays due to seasonal backlog. 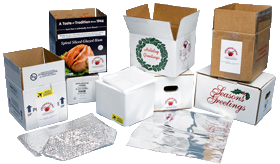 AWF will at their discretion ship packages early to ensure delivery prior to the requested date during holidays where seasonal backlog is expected. We recommend express shipping to ensure the product arrives in the best quality and condition possible. If you have clients, employees and/or loved ones in Hawaii or Puerto Rico, please let us provide them with a Basket, Ham or Turkey from you. We are experts in filling your Hawaii and Puerto Rico orders.